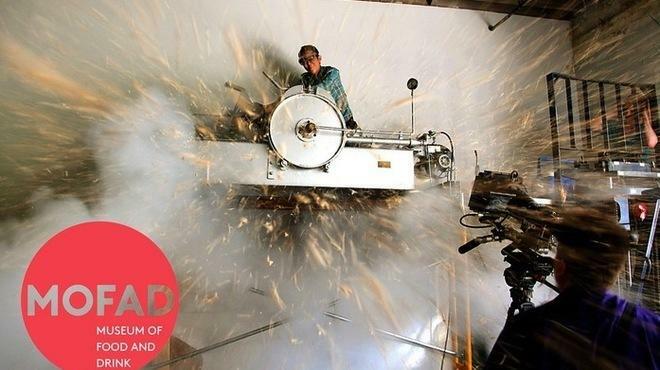 Pledge funds toward the museum's first show, featuring an exploding cereal-puffing gun. It's hard to believe that this food-crazed town doesn't have its own museum devoted to the edible universe. However, that'll change when the Museum of Food and Drink opens. Though it's still in the planning stages—neither a permanent location nor opening date has been set for the institution—we're already psyched about the project. It's the brainchild of Dave Arnold, Booker and Dax's madcap cocktail man, and features restaurant royalty such as David Chang, Mario Batali and Wylie Dufresne on its star-studded board. The in-development institution is looking to raise $80,000 via Kickstarter to launch its first exhibit, "BOOM! The Puffing Gun and the Rise of Breakfast Cereal." It's all about the humble breakfast food and will feature a 3,200-pound puffing gun so you can see with your very own eyes how your Rice Krispies are made. Tentatively slated to open in August, the traveling exhibition will take the explosive contraption to public spaces like schools, streets and plazas. MoFAD has until July 20 to raise the funds. Head over to Kickstarter to contribute, and watch the detonating device in action in the video below.